It's time to break out the seasonal fruit! We love strawberries and pineapple. These hors d'oeuvres would be great for any backyard bbq. 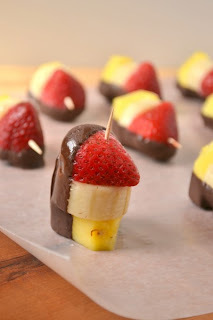 Arrange the pineapple, banana slice and halved fruit pieces on a toothpick and then dip one side into the melted chocolate. Place on wax paper to cool.